An e-commerce app’s growing popularity can be attributed to the convenience, flexibility and the ease of purchase that it provides to its user, while they are on the go. App developers who are able to provide an ‘app experience’ to the users are on the right track considering that mobile accounts for 50.3% of all e-commerce traffic today. But an e-commerce app cannot be ‘just’ an extension to the core business. Apart from being able to offer the above mentioned benefits, an e-commerce app should be able to hook its user in a way which is different from its offline business. A great example here is the Starbucks app that entices a user with benefits that are way different than its offline business model. The idea is simple. To thrive in this competitive scenario, an app developer needs to have a strategy that not only hits the bulls-eye, but can also increase a user’s app experience by providing them with in-app moments! Referral marketing facilitates and provides the right cure to this problem.An E-Commerce app is bound to benefit from a referral program in more ways than you can imagine. This might not be convincing enough and therefore it is important to answer the big why around it and then proceed on to the various scenarios in which referral marketing can help your app to grow. 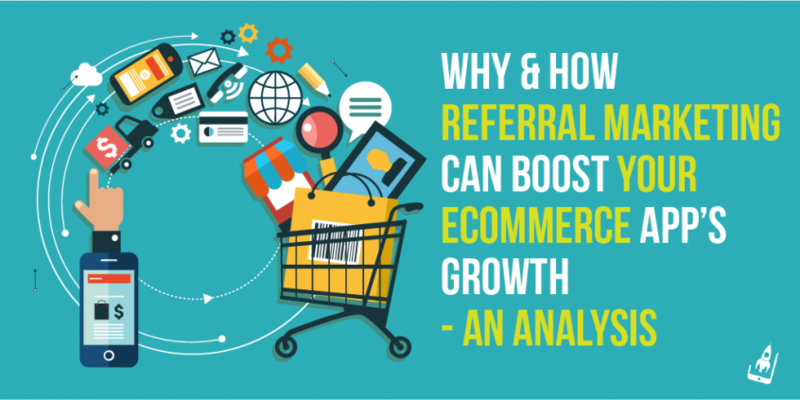 Why Referral Marketing For Growing An E-commerce App? We often value the opinions of our friends, family, and others in our network when it comes to buying a product. As an individual, I have often delayed my purchase decision simply because I couldn’t find anyone in my network who had tried the product. Imagine the same scenario with your E-commerce app. The number of repeat users is a powerful number, but what requires your attention are the ones that are new. Since our buying decisions are based on opinions, which in turn are an extension of trust, there’s no better way than in-app referral program to bridge this gap and excite your new users. An increase in new and repeat users is definitely a good sign of growth. Now that you’ve gained some insight on this marketing tactic, let’s evaluate the various ways in which it can help an app grow! This may sound insane, but there’s much truth to the fact. A great In-app referral program would be talked about at length, with or without promotion. Incidentally, we are not limited to sharing our opinions in a restricted manner, much like in our grandma’s time. Today, users will not shy away from sharing a great referral program on social media. Simple things like a twitter post that shares a referral link or an Instagram/Facebook post that appreciates how a user benefited from your E-commerce In-app referral program, can significantly boost your app’s image and also bring in more users, considering that it is coming from a trusted source. According to research done by Comscore, 4 out of 5 users use a smartphone to shop. This does not necessarily mean that it is via an app. In most cases, it is observed that users shift from a mobile app to a web interface while buying a product online. Even though this trend is changing, a few E-commerce apps may still face this challenge in case their users aren’t getting the same experience as that of web. A decline in purchase through the mobile app may eventually impact an app’s popularity within the target market as well as on the app store. Referral marketing can offer a unique solution to an app that is facing a similar challenge. By offering an ‘app only’ discount on a referral program, developers can bring back the focus on their E-commerce app as opposed to a mobile site. Referral marketing is one tactic that can be customized, tested and modified and thus checks all the right boxes for an e-commerce app growth. Imagine a scenario where you are looking for a particular product and can’t find it on the app. What is the next step that you’ll take? In most cases, you won’t exit the app immediately. This is because shopping satisfies our desires. At least half of mobile shoppers make a purchase monthly using their smartphone. Offering a mobile app with a dedicated referral program persuades them a step further to make a purchase. Scarcity– In-app referral programs manage to tickle that bone with your app. Most app users perceive an in-app referral plan to be ‘limited period’ only. It makes them use this opportunity to buy more due to fear of potential loss. 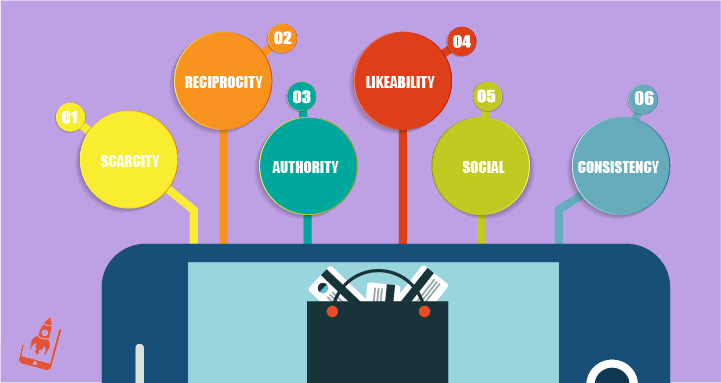 Reciprocity– A referral program boosts reciprocity. An app user who has indulged in your referral program is going to buy more from your e-comm app. Authority– Referral program establishes authority- an existent referrer acts as an authority and thus persuades other around him to purchase from your mobile app. Likability– Referral programs are loved by everyone, and it would be rare if an app user doesn’t feel like that. Social– Referral programs act as a social proof and in a way lead the path for new users. It is also proven by research that people trust recommendations from friends 7X more than traditional advertising. Consistency– Referral marketing builds consistency within users. It has been observed that people tend to honor agreements (in this case continually purchasing via the app) even after the original motive or incentive is not present. Optimize your app for devices– A developer should see that their app is compatible with all devices and that all their customers can view this feature on the app homepage. Offer a +1 feature– Imagine a scenario where both you and your competitor are offering a similar app referral program to prospective users. To be a step ahead, it is important to offer a +1 feature. This could be done by sharing special benefits with the new users for a limited period and gaining their attention. Once developers are successful in doing so, they can award extra purchase points (that can be redeemed) if prospective users refer more users on a given day. Developers can also use products like AppVirality to filter their influencer data and share a price drop alert with these users. 3) Tie referral marketing with social media-Social media plays a significant role in promoting an app referral program. A consumer survey done by Adobe states that 71% of social media users access social networks come from a mobile device. This premise coupled with in-app referral makes it a potent mix that can spurt an e-commerce app’s growth substantially. 4) Align Referral Marketing with industry data– When it comes to mobile apps the trends change quite drastically. According to Econsultancy, most app purchases happen after 7 pm. The research also states that iOS users convert the most on Friday as compared to Android users, which in turn convert the most on Saturdays. This data can be used while promoting app referrals through push notifications, SMS campaigns, newsletter, etc. thereby bringing out the best for your e-commerce app. Here’s an interesting stat to close this conversation. A whopping 85% of shoppers choose an app over a website for shopping as stated by Econsultancy. This means two things. One, a mobile app is no longer a luxury but a staple for your e-commerce business and two, that your users will jump to your competitor’s side if you don’t have a unique strategy to hook them. Considering that word-of-mouth marketing is 92% more effective than any other type of marketing it is the best tactic to bring in more credibility to your app, increase app downloads and hook your users for long,all aspects that qualify growth!